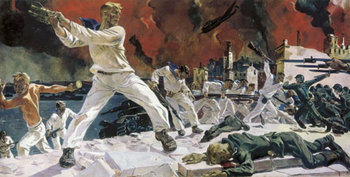 A rapid thrust was launched towards Sevastopol on 30 October 1941 which commenced the Defence of Sevastopol (Russian: оборона Севастополя), consisting of two infantry divisions and one motorized brigade. The Germans tried to burst into the city from the north, north-east and east, but were beaten back. The Germans then encircled the city. During this time the city was reinforced by sea, receiving the bulk of the Soviet troops evacuated from Odessa. A more prepared attack was launched, and this soon intensified into an all-out effort. On 11 November 60,000 Axis soldiers launched another attack, but after ten days were forced to halt the attack. The attacks were repelled, primarily because von Manstein decided to attack the enclave's southern flank, counting on its seemingly poorer fortifications. The terrain in the south was prohibitively difficult, however, and the Germans failed to force a breakthrough. On 4 December the local Soviet command reported that the defences had been re-established. On 1 November 1941 official Soviet records report their forces in the Crimea as consisting of the Separate Coastal Army with the 25th, 95th, and 172nd Rifle Divisions, 7th Naval Infantry Brigade, 2nd, 40th, and 42nd Cavalry Divisions, three to four artillery regiments, a fighter aviation regiment, and support units. The other major formation, the 51st Army, consisted of HQ 9 Rifle Corps, the 106th, 276th, and 320th Rifle Divisions, three artillery regiments, 120th Separate Tank Battalion, and eight aviation regiments. Forces directly under Crimea HQ consisted of the 156th, 184th, 271st, and the 421st Rifle Division, and the 48th Cavalry Division. With the defences reestablished, Von Manstein abandoned the attack in the south and transferred his forces to the north. The Germans also moved in their largest artillery piece, the 31-and-a-half inch gun Schwerer Gustav in preparation for another attack. The Wehrmacht began a five-day artillery barrage of the city. On 17 December 1941 six German infantry divisions and two Romanian brigades with 1,275 guns and mortars, over 150 tanks and 300 aircraft launched the second attack. The late date meant that inclement winter weather hindered the Luftwaffe's operations, and the Soviets used this to reinforce the enclave. On 21 December as the Germans, who had broken through Colonel Kudyurov's 40th Cavalry Division to a point less than two kilometres from Severnaia Bay, prepared for their final push, the Soviets launched a counter attack, forcing them back with the aid of the newly arrived 79th Independent Naval Infantry Brigade. The second storming attempt also failed. The 79th Brigade and the 345th Rifle Division had just been shipped in by a Soviet flotilla consisting of the cruisers Krasnyi Kavkaz, Krasnyi Krim, the destroyer Kharkov and escorts under the personal command of Vice-Admiral Oktyabrskii. By 4 January 1942 every Axis unit had been stopped by Soviet counter-attacks. 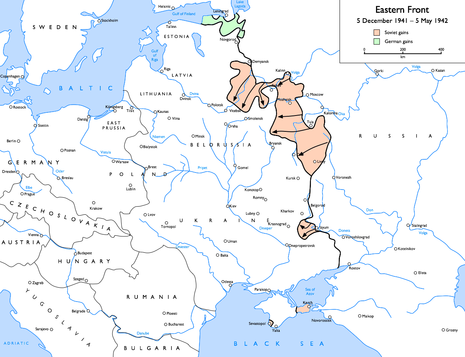 Shortly thereafter the Soviet winter offensive began, producing the Wehrmacht's so-called "Winter Crisis." The fortress of Sevastopol was initially constructed in the two decades between the years 1806 and 1825. These ancient forts showed great strength in the Crimean War, 1854 - 1856, when they held up an allied army composed of British, French, Italians, and Turks for a period of nine months. Since 1939, the Soviets devoted special attention to the modernization and enlargement of this fortress, recognizing that, with the coming of airpower, the retention of the Crimea was all-important for control of the Black Sea. An examination of the map discloses that the island-like Crimean Peninsula lies in the middle of the Black Sea, and that an air force based on Crimean air fields can control the maritime trade routes across the Black Sea in any and all directions.